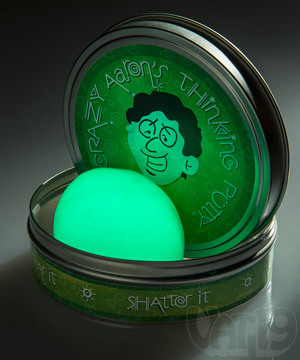 Charge Glow in the Dark Thinking Putty by exposing it to a light source and it will radiate a bright green in darkness. Intensify the fun and record an object's silhouette onto the surface of the putty. 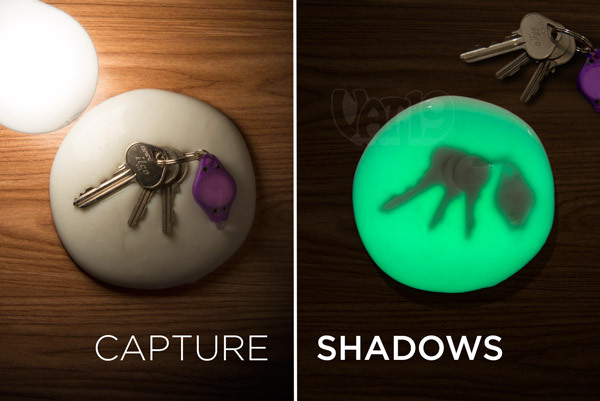 Or use the optional black light keychain to draw, doodle, and write with light on the putty's exterior. 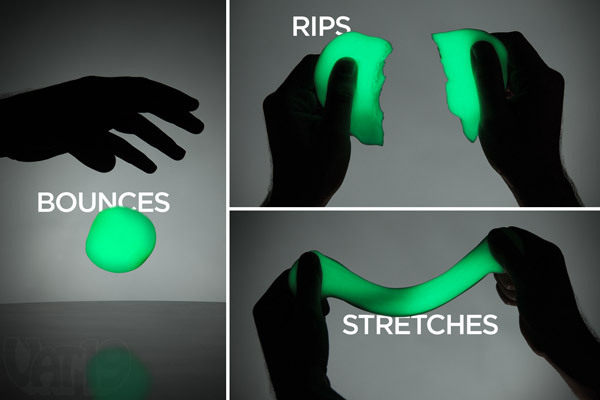 Glow in the Dark Putty will also provide hours of "daylight" fun as it can be stretched, pulled, molded, bounced, and even ripped in half (and put back together again, of course!). Made in the USA. Stretch it, bounce it, and rip it in half! 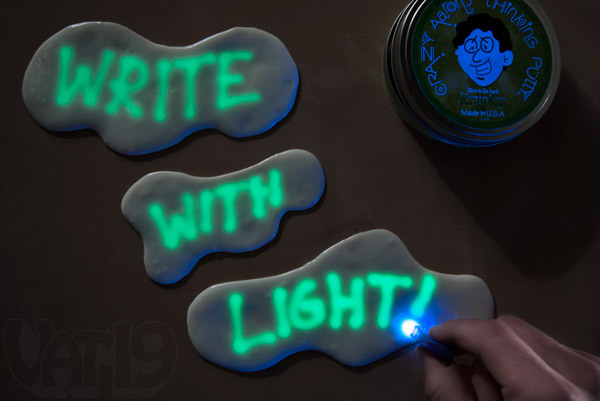 Like regular (aka awesome) thinking putty, but it also glows in the dark! At Vat19, we're big fans of putty. Like other cool fidgeting devices, putty just never seems to get boring. In the case of Glow in the Dark Putty, the fun is amplified when the lights are turned off. Glow in the Dark Putty emits a bright green glow when the lights are turned off. Bounce it! Stretch it! And rip it like paper! Because putty is a slow-moving liquid (precisely it's a non-Newtonian fluid), it is blessed with some unique physical characteristics. Simply put, the rate at which force is applied to the putty directly corresponds to how it behaves in response to that force. When the force is applied slowly, the putty will act more like a liquid. When the force is applied rapidly, putty behaves like a solid. So, when pulled slowly, the putty will stretch. However, when dropped or tossed, the putty acts like a solid and bounces. And when a shearing force is applied quickly, the putty will rip. So, charge up your putty (simply hold it next to a bright lightbulb for a few seconds), and enjoy this non-Newtonian fluid as it glows in the dark! Glow in the Dark Putty exhibits the characteristics of both a solid and a liquid. Shadow puppets? How about shadow putty! Imprint silhouettes onto the surface of your Glow in the Dark Putty by resting an item on it while charging it with a bright light. When you remove the item, a detailed silhouette remains. That's fun, y'all. Temporarily save an object's silhouette to the top of the putty. Glow in the Dark Putty glows when "charged" by a light source. As it turns out, black light works great for this purpose. 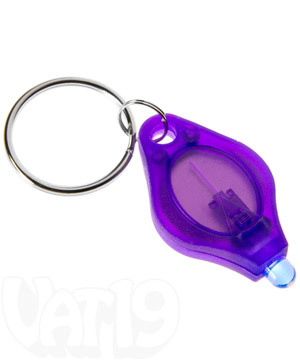 And with our keychain-sized black light keychain, you can draw, scribble, or write messages onto the putty. Transform your putty into a glowing Rosetta Stone with the optional black light keychain. Question: Can you cover a room in 850 pounds of this putty? Answer: If you're Vat19, you can. We covered a room in thinking putty! Question: Will the glowing property ever fade? As soon as the putty is charged by light, it will begin to glow (which is best viewed in a dark room). Over time (depending on how long it was initially charged), it will glow less brightly. Expose the putty to more light to recharge it. Awesomely, its ability to recharge will not diminish over time. So, unlike rechargeable batteries which seem to diminish in capacity over time, your Glow in the Dark Thinking Putty will continue to glow for years. Question: Is the black light keychain included with the putty? Answer: No, the black light keychain is sold separately. Question: How much putty do you get? Answer: Each tin includes 1/5th of a pound of putty. The ball is a bit larger than a racquetball and only slightly smaller than a tennis ball. Answer: Nope. But if that's your thing, we've got you covered with our Magnetic Thinking Putty. Question: Should I get this putty, the Magnetic Thinking Putty, or the Super Illusions Putty? Answer: Why thank you for asking such a cross-promo heavy question! We love all of our putties and couldn't possibly pick a favorite. Each one is equally unique. The bottom line is that if you're a true Vat19 fan, you'll buy all three (wink, wink, guilt trip, guilt trip)!